The founder of the Pearl Lang Dance Theater was a choreographer and dancer who worked with the Dutch National Ballet, the Boston Ballet, and the Batsheva Dance Company of Israel, among other companies. She choreographed 63 works for her own company, more than half of them devoted to Jewish themes. 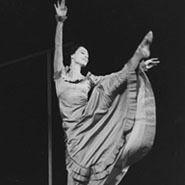 One of her best-known dances was Shirah, choreographed in 1960 and reflecting Hasidic lore about rebirth. A devoted follower of Martha Graham, Lang taught at Yale, the Juilliard School, and the Neighborhood Playhouse. She received two Guggenheim Fellowships for Choreography as well as numerous other awards and citations.